Spacious 110 year-old church has two halls, and romantic courtyard & grotto. ** OPEN CATERING ** arrange your own food and beverage! Have both Wedding and Reception, save time and money. 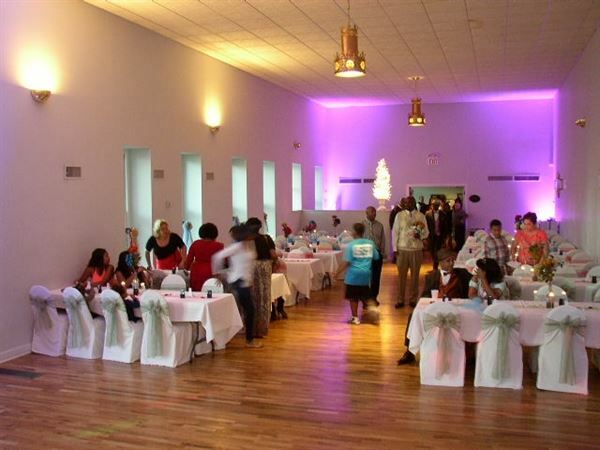 The spacious ballroom has a capacity of 225, with stage and nearby kitchen. Wedding arch & many decorations included. Outdoor weddings in our romatic Southern style courtyard with a grotto and veranda. Ballroom as badweather backup. Causal parties in the Skylight Room. Birthdays, luncheons, meetings, concerts, more. Your event can be spectacular! Easy highway access for out-of-town guests, hotels and restaurants nearby. Open Dates ~ Available On Short Notice. $300 reserves hall, payment arrangements for balance. ~ Discounts ~ 2017 Dates - 10 % Discount off normal rental prices, for dates at least 6 months away, when paid in full 30 days after the first reservation payment is made. 2018 Dates - 10 % Discount off normal rental prices, if paid in full by June 1st, 2017.